Note – 10/31/16: I’ve released the 3rd edition. You can get it here. If you’re on my email list and didn’t get the link to the 3rd edition, email me. For roughly the past 18 months I’ve wanted to write a 2nd edition of my free guide. Like everything else on this site, the guide is meant to be a resource for business owners with a DIY streak who want to get more visible to customers in the local search results. I’m proud of the old one, and it helped many business owners. Reading over it recently, I was surprised at how many of the basic principles still hold water. It’s just that 2 1/2 years is a while. Especially because any info about Google and the rest of “local” doesn’t exactly have the shelf life of a Slim Jim. Anyway, after way too long – and enough typing to make my local chapter of the Typing Fingers Union go on a violent strike – the 2nd edition is done. I’d love your feedback on it. Thanks, Phil. 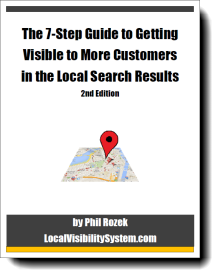 This has been my bible for learning local search, and now I’m gobbling up your second edition. Thank you very much! Any time, Chris. I’d love your feedback on how to make this 2nd edition better. 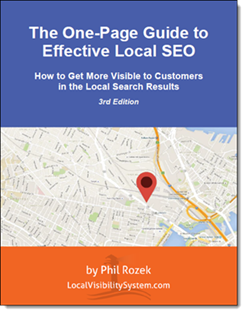 Thanks Phil, I’ve just downloaded your guide following a recommendation from the Google+ Local SEO Community. Given the 2014 updates in Local Search, Pigeon etc, dare I say that version 3 is required? Edition 2 isn’t terribly out-of-date: it’s from November 2013. But Edition 3 is on the to-do list.